The Fosters’s spin-off expands the notion of family — and increases visibility for queers of color and bisexuals. On a rainy night in late November, cast members from The Fosters’s spin-off Good Trouble supped on an upscale millennial dinner of gold-coated hot dogs and Ramen Alfredo on a set table in the back of a moving van emblazoned with the show’s title and parked several hundred yards below the Hollywood sign. In a quintessentially oddball Hollywood moment, actors Sherry Cola and Tommy Martinez (pictured), whose characters carry forth The Fosters commitment to LGBTQ representation, mingled with influencers and journalists while praising Good Trouble’s deeply queer pedigree. But as Cola and Martinez huddled together and sipped on smoking vodka cocktails and bit into gourmet bacon and donut sandwiches, another narrative emerged — that those involved with the intersectional Good Trouble had also become family. Freeform’s benchmark 2013-18 series The Fosters centered around biracial lesbian moms (Stef and Lena Adams Foster) raising biological, adopted, and foster kids. At its core, the show was about found family and unconditional love. Its spin-off, which premiered in early January, fast-forwards to the post-college life of the Adams Foster sisters, Mariana (Cierra Ramirez) and Callie (Maia Mitchell). This fast-paced, edgier heir to The Fosters, with its jumbled chronology and flashback storytelling, amps up the notion of extended family. Where Stef and Lena brought family into their home, on Good Trouble, their daughters seek out a new family as they navigate the various personalities of the denizens of the Coterie, a funky downtown Los Angeles communal living space where they land. It’s there that Cola’s Alice, a codependent lesbian who bows to the will of her ex-girlfriend, and Martinez’s Gael, a bisexual artist Callie falls for, become part of a larger surrogate family for Callie and Mariana. Television has proliferated with queer characters in the years since The Fosters premiered, with ever-increasing representation on shows including Transparent, Pose, and The Bold Type. So it’s no surprise that Good Trouble, from gay executive producers Peter Paige, Bradley Bredeweg, and Joanna Johnson, would offer up varied representations of young queer people. Still, both Cola, who is Asian and identifies as bisexual, and Martinez, who is straight and hails from a Catholic Latinx family, recognize that their intersectional characters rarely seen on TV will provide long overdue representation. With hits like Crazy Rich Asians and Netflix’s To All the Boys I’ve Loved Before (which costars Fosters alum Noah Centineo), Cola, who is also a standup comic, recognizes that some strides have been made in pop culture in terms of finally telling stories about Asian people. But she says that Alice is still an underrepresented character with the potential to become a touchstone for some viewers. “We’ve seen a lot of LGBTQ stuff, we’ve seen some Asian stuff. But this is specific — Asian girl struggling with her sexuality, or not being able to be fully herself as a human being in front of her parents. That’s a lens that not a lot of people see on the screen,” Cola says. Fans of the CW’s Riverdale will recognize Martinez from his role as a member of a rival gang to Archie’s, but on Good Trouble his Gael is a landmark bisexual man in a television landscape that all but erases bi men. By the close of Good Trouble’s pilot, it’s revealed that Gael, who has begun dating Callie, also has a boyfriend. But with Paige, Johnson, and Bredeweg at the wheel, Gael is a fully-realized, multi-layered character who avoids tropes and whose sexuality becomes part of an essential discussion about biphobia. Like The Fosters before it, Good Trouble tackles an array of political and sociological issues including police brutality against people of color, sexism in the tech world, and body positivity. 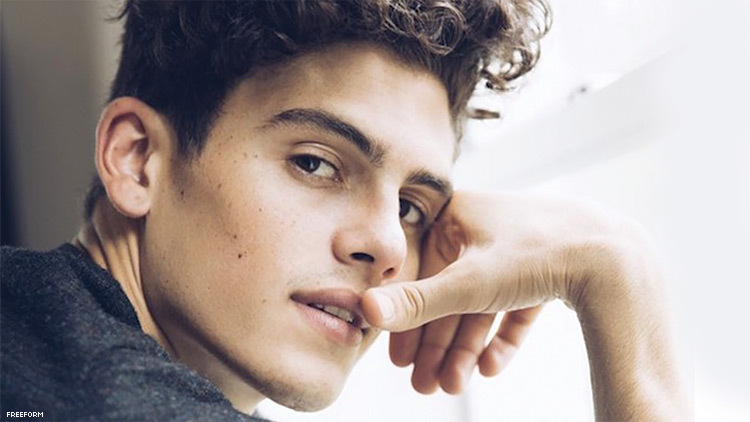 Martinez embraces the show’s issues-oriented storytelling, especially in terms of his character and the biphobia he discovered when a young woman from his acting class heard about Gael and made a “sour face,” saying that she doesn’t believe bisexuality exists. “I was freaking stung by that,” Martinez says. But he doesn’t dwell on the negative for long. He turns to the good he hopes characters like Gael and Alice will do.